The bull case for oil and liquefied natural gas remains in place, according to Goldman Sachs' Jeff Currie. 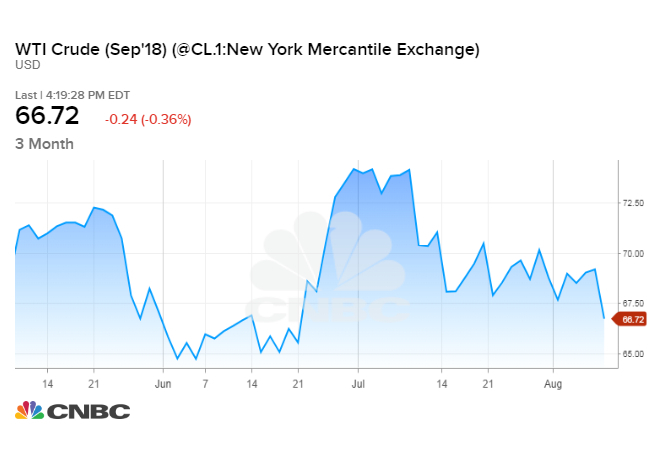 An escalating trade war between the United States and China has raised fears about slowing global growth that could cut demand for crude oil. Strong global economic growth and energy demand, low inventories and the failure of supply spikes to develop underpin Goldman's view. The chief commodity researcher at Goldman Sachs says the bull case for oil remains in tact despite an escalating trade dispute between the world's two biggest economies that has stoked fears of weakening demand for crude. But Jeff Currie, Goldman's global head of commodities research, is keeping his $70 price target on U.S. crude for 2018, pointing to global economic growth that is tracking around 4.3 percent and could accelerate to 4.7 percent in the bank's view. "When we look at the fundamental picture, it really hasn't changed," he told CNBC's "Closing Bell" on Thursday. "You've seen substantial liquidation, really off of the headline risk around tariffs, but the underlying fundamental story and the case for owning commodities, as well as oil, really remains in tact." Currie says low stockpiles of crude means supply shortages could develop in the face of today's strong oil demand. At the same time, labor strikes at Chile's Escondida mine have kept a lid on copper supply, while Saudi Arabia is not flooding the market with as much oil as feared following an agreement by producers to hike output. "The reason why is it can be redirected," Currie said. "You're not going to impact oil because there's so many producers, so many consumers." On Wednesday, the Wall Street Journal reported that Goldman's commodity trading unit is in talks to purchase its first cargo of LNG from Houston-based Cheniere Energy. Currie did not comment on the report, but laid out a bull case for LNG prices, saying U.S. exporters are well-positioned to meet growing demand from Asia.